This is a severe form of abnormal oesophageal motility that can sometimes produce retrosternal chest pain and dysphagia. 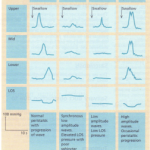 Swallowing is accompanied by bizarre and marked contractions of the oesophagus without progression of the waves. On barium swallow the appearance may be of a ‘corkscrew’. However, asymptomatic changes in oesophageal motility are not infrequent, particularly in patients over the age of 60 years (presbyoesophagus). Care must therefore be taken that the symptoms, the manometry and X-ray findings of oesophageal spasm are not falsely attributed. 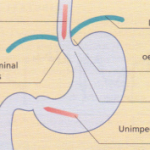 A variant of diffuse oesophageal spasm is the nutcracker oesophagus, which is characterized by finding very highamplitude peristalsis (pressures >200 mmHg) within the oesophagus. Chest pain and dysphagia occur. True oesophageal spasm producing severe symptoms is rare and treatment is often unhelpful. Antispasmodics, nitrates, or calcium channel blockers such as sublingual nifedipine 10 mg three times daily may be tried.Occasionally, balloon dilatation or even myotomy is necessary. Abnormalities of motility that are mostly asymptomatic but occasionally produce dysphagia are found in the elderly in diabetes mellitus, myotonica dystrophica and myasthenia gravis, as well as in any neurological disorder involving the brain stem. • Immediately above the upper oesophageal sphincter (pharyngeal pouch). If large, it may cause dysphagia as well as spillage of contents into the trachea. • Near the middle of the oesophagus (traction diverticulum produced by extrinsic inflammation). • Just above the LOS (epiphrenic diverticulum). Only when symptoms are severe should surgery be undertaken. Rings and webs. A number of rings and webs have been described throughout the oesophagus. Lower oesophageal or Schatzki ring This is a narrowing of the lower end of the oesophagus due to a ridge of mucosa or a fibrous membrane. The ring may be asymptomatic, but it can very occasionally produce dysphagia after swallowing a large bolus of bread or meat. 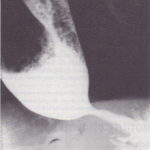 The narrowing or ring is seen on a barium swallow, with the oesophagus well distended with barium. The treatment is reassurance and dietary advice. This is a constriction near the upper oesophageal sphincter in the postcricoid region and appears radiologically as a web. The web may be asymptomatic or may produce dysphagia. In the Plummer-Vinson syndrome (Paterson- Brown-Kelly syndrome) this web is associated with ironeficiency anaemia, glossitis and angular stomatitis. This rare syndrome affects mainly women and its aetiology is not understood. At oesophagoscopy the web may be difficult to see. Dilatation of the web is rarely necessary. Iron is given for the iron deficiency. Peptic stricture secondary to reflux is the commonest cause of benign strictures. They also occur after the ingestion of corrosives, after radiotherapy, after sclerosis of varices and following prolonged nasogastric intubation. All strictures give rise to dysphagia. They are usually treated by dilatation, but occasionally surgery is necessary. It is occasionally difficult to distinguish between these either on barium swallow or oesophagoscopy, as only widespread ulceration is seen. In candidiasis the characteristic white plaques on top of friable mucosa are frequently found, but oral candidiasis is not always present. The dianosis is of Candida can be confirmed by examining a direct smear taken at endoscopy, but often infections are mixed and cultures and biopsies must be performed.